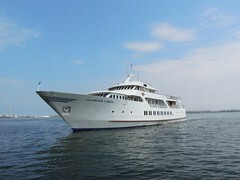 Our majestic flagship the “Captain Matthew Flinders” offers 144 ft of unparalleled luxury onboard! 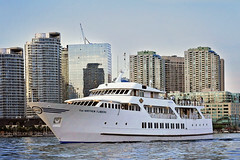 The largest & grandest of all passenger ships in Toronto and stunning from bow to stern, the Flinders’ original custom build now reflects a transitional style – without compromising its superior boat design and layout. 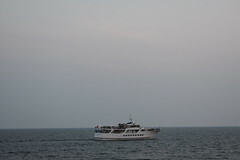 The Flinders’ interior colour palette of marine blue, gold and burgundy, is a reflection of her classic nautical beauty. A bright and welcoming entrance foyer features warm, honey-toned wall panels. Lush wool carpeting in rich indigo hues and classic marine striped valances atop the many windows on both interior salons and enhance the classic nautical feel. The Flinders’ stately bars of Tasmanian myrtle hardwood are now complemented with long stretches of stunning bronze-flecked quartz counters and are showcased in soft blue lighting. For your comfort, the dining salons are outfitted with stylish chiavari chairs. Conscious of the environment, the Flinders now employs the latest in marine LED technology. Her spacious interior spaces are now lit with clean, white lighting, with dimmers to set the mood. 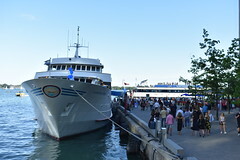 This upgrade, coupled with the main engine replacement in 2007, now makes the Captain Matthew Flinders operate with the smallest carbon footprint of any vessel of comparable size in Western Lake Ontario. 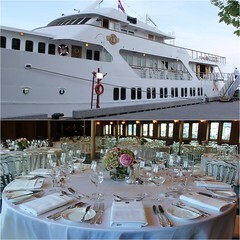 Your event will leave a lasting impact on your guests, while minimizing the impact to the environment. An incredible sound system boasts over 80 speakers and is centred around the innovative Symetrix Jupiter 8 – which provides clean, balanced sound throughout the ship. 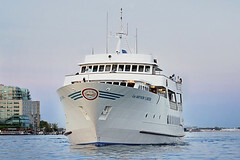 Separate sound controls are available on each of the Flinders’ three decks and an LCD projector with retractable screen are also available onboard. 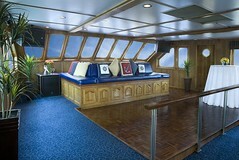 The Captain Matthew Flinders provides climate-controlled comfort in both interior salons. 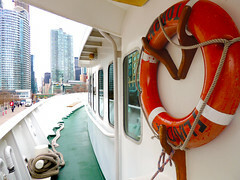 The spacious and comfortable outer decks offer your guests an incredible open-air experience while touring through Toronto’s dazzling waterfront. 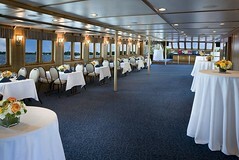 Make your next event unforgettable by hosting it on this spectacular vessel and you will soon understand why it is a ship of celebrity status! Private Charter Rates can vary. Please contact us for a customized quote. 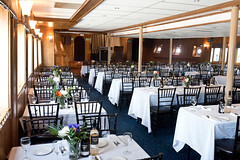 Menus start at $26.90 per per guest, with bar options available. 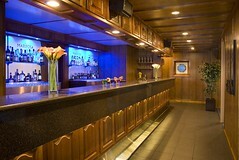 *All interior and covered areas of our ship are non-smoking areas. 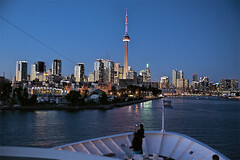 In compliance with Smoke Free Ontario, guests who smoke may do so only in the designated smoking section on the stern deck of the Captain Matthew Flinders, where food and beverage cannot be consumed. Take a Virtual Tour of our Boats!